A few more photographs from this past week in Campinas, Brazil. It rained during the afternoon but stopped by the time I arrived back at the hotel, allowing me to stroll the lavishly landscaped grounds during the mild evening hours. There is a pink-flowered shrub forming a hedge row in back of the hotel that is highly attractive to many types of insects. The identity of the shrub remains a mystery to me, and most of the insects I’m finding on it I can recognize only to family – I’m hoping the hotel staff will be able to name the former and that the readers of this blog might be able to provide IDs for the latter. Calycopis sp. poss. origo (Lepidoptera: Lycaenidae). ID by Dave Hubble and Chris Grinter. It took a bit of effort to find an unobstructed view of this hairstreak butterfly (family Lycaenidae) as it visited the flowers within the shrub. Every time I tried to move foliage out of the way to get a good view, the butterfly became alarmed and flew to another part of the hedge row. My antics drew the attention of a hotel worker, who was apparently interested enough in what I was doing to act as a spotter whenever the butterfly flew to help me relocate it. Eventually I got a few shots that I was happy with, including the above. A flesh fly (Diptera: Sarcophagidae). I presume this to be a type of flesh fly (family Sarcophagidae) based on the stout bristles and color pattern that seems typical for the family. 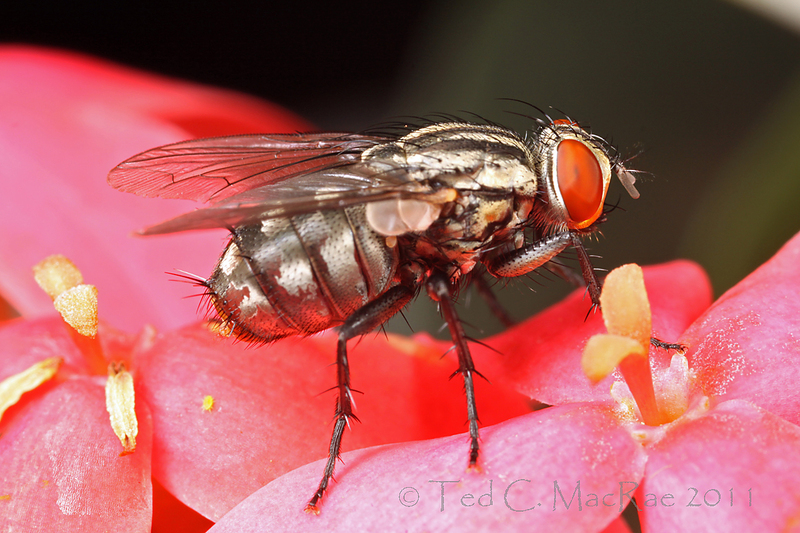 I like the striking contrast in coloration between the fly and the flower. There are a few fly bloggers who I’m hoping might be able to give a better identification. A potter/mason wasp? 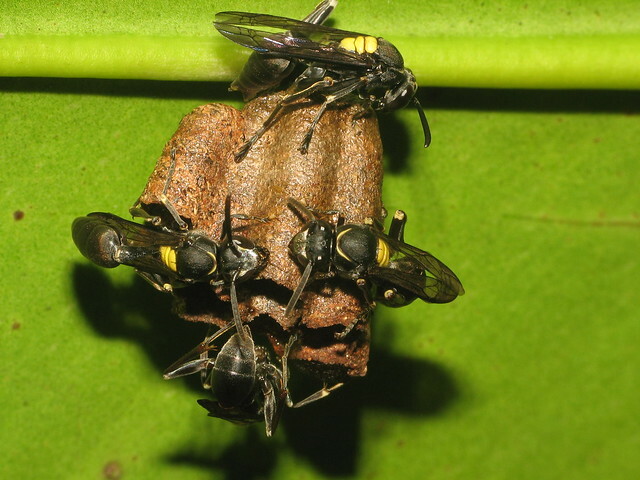 (Hymenoptera: Vespidae). This appears to me to be some kind of potter or mason wasp (family Vespidae, subfamily Eumeninae) – it was a bit smallish at only about 12mm in length. 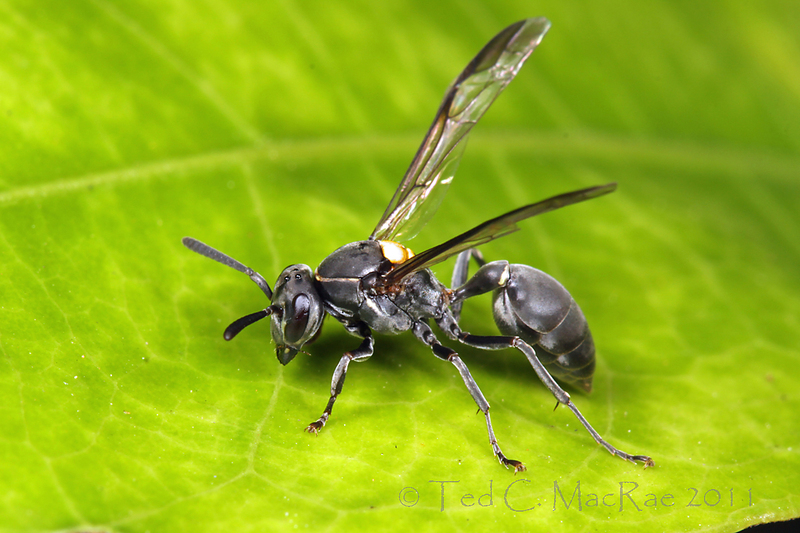 I hope one of the knowledgeable wasp bloggers out there (ahem… Eric?) can at least confirm this level of identification and perhaps the tribe or genus as well. 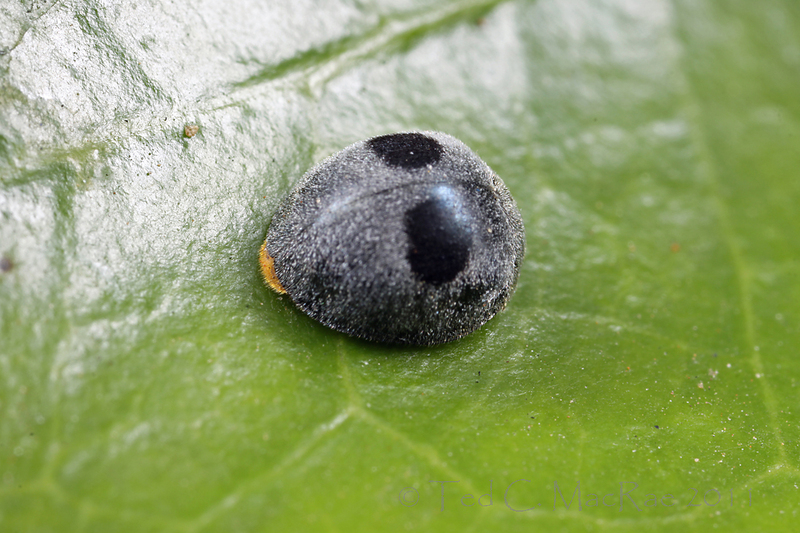 Azya orbigera (Coleoptera: Coccinellidae). ID by Tucker Lancaster. Every ladybird beetle (family Coccinellidae) I’ve ever seen is some variation of black and red/orange/yellow and has a smooth, glabrous appearance. This beetle is cobalt blue with a dense pubescence over the dorsal surface, but it still seems to me to be some type of ladybird beetle. It was a tiny little thing, so I suppose it could be one of the multitude of small beetle families with which I am unfamiliar. 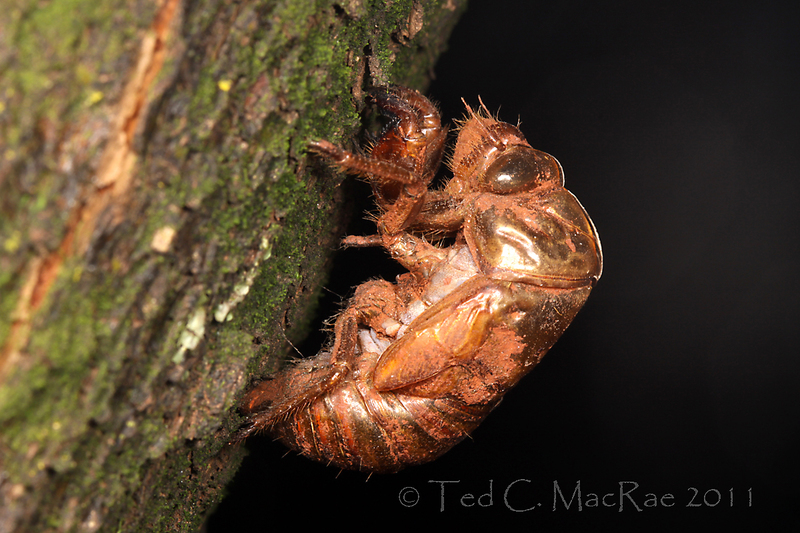 This cast cicada exuvium was not on the shrub, but on a nearby tree at about eye level. I really wish I could have seen the cicada that emerged from it, because this is certainly the biggest cicada exuvium I have ever seen. I was about to simply label it “family Cicadidae” but seem to recall that cicada higher classification is in a bit of flux these days. At any rate, given its great size I wonder if it might represent one of the giant cicadas in the genus Quesada. I still have many more insect photographs from the past week and will certainly increase that number over the next week as well. Stay tuned! This entry was posted in Cicadidae, Coccinelidae, Coleoptera, Diptera, Hemiptera, Hymenoptera, Lepidoptera, Lycaenidae, Sarcophagidae, Vespidae and tagged beetles, Brazil, Brazil Bugs, butterflies, cicadas, entomology, flesh flies, flies, insects, ladybird beetles, nature, potter wasps, science, wasps. Bookmark the permalink. 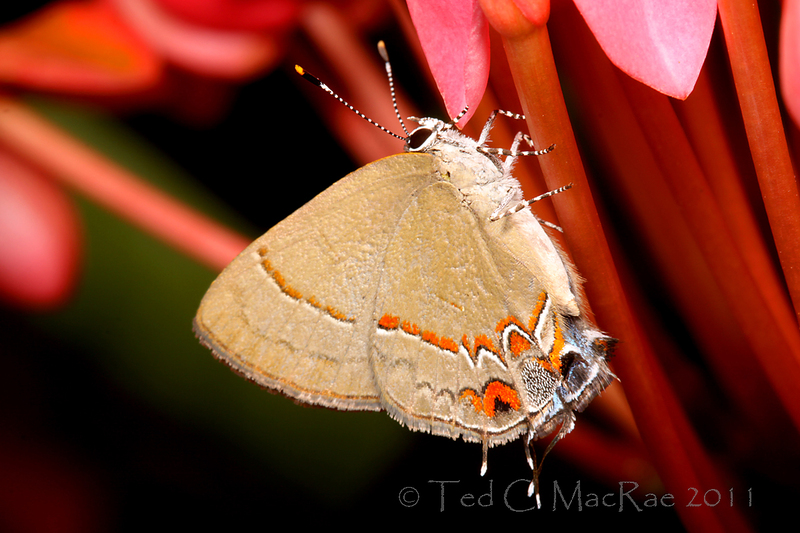 That hairstreak looks like it’s in the genus Calycopis. Without the upperside (which is really striking – black forewings with metallic blue hindwing) – I would suggest it might be in the species groups “antius” or “malta”. Jealous of Brazil! That fly is probably a Sarcophagid with those stripes on the thorax! Great – thank, Chris. I don’t recall seeing any flashes of metallic blue when it was flying, but it was small and flew rapidly. Wonderful photos as ever Ted, can’t wait to see more highlights from your travels. Thanks, David – cool ladybeetle! Beautiful pictures as always. How big those giant cicadas can get? From what I’ve read, the biggest one (Q. gigas) can have the body 50mm in length (right at 2 inches). The exuvium wasn’t that big, but it was close. Glad you like your spot in the lineup! Great photos. I would be hard pressed to pick a favorite, but maybe the lady beetle. Thanks, Troy. I’m always interested to see what people’s favorite photo is when I post a variety – almost never is it the one that I think it will be. that beetle looks a lot like Azya orbigera, which is in fact a ladybeetle. Cool – thanks for the ID. Glad to know I could recognize the family despite the unusual coloration and pubescence. According to Henry Hespenheide (who left a comment on my Facebook post about this) – Azya spp. are models for beetles in the genus Hylaeogena (family Buprestidae). I agree with Chris Grinter that the butterfly is Calycopis – I think (but can’t be sure) that it’s C. origo, separated from the similar C. caulonia by the more pointed, narrow black triangle within the orange mark at the bottom of the photo. In C. caulonia I believe the black mark is broader & blunter, though there is likely to be variation. The beetle – I think Tucker is spot on – Azya orbigera. The fly – hmmm… I don’t suppose you have a ‘plan view’ showing the wing venation? Thanks, Dave – I’ll put a provisional ID in the caption and credit you and Chris. Sorry, no full dorsal view for the fly – this was the only shot I got off before it bolted (and I was quite amazed that all-in-all everything about the shot was pretty good). There’s no place like the tropics (well, maybe except for the southwestern U.S. … or California!). Nice shots Ted! As for the fly, I’ll tentatively agree that it’s a Sarco, but I wouldn’t rule out Tachinidae either. In fact, the more I look at it, the more I start leaning towards a tachinid. I don’t have my Manual of Neotropical Diptera here at home, but I’ll check it tomorrow when I’m at the lab! Thanks, Morgan – you know I’m pulling for Sarcophagidae now since I put it out there, but if it’s a tachinid then so be it. Hope you can come up with something. Well, that didn’t help… depending on whether the subscutellum is developed or absent (which I can’t see in this photo but maybe you can in B-roll shots) it keys to Tachinidae or Sarcophagidae! If the subscutellum is “strongly developed, prominently and evenly convex in profile” then it’s Tachinidae; if the subscutellum is “absent or weakly developed” then it’s Sarcophagidae (Sarcophaginae). Sorry I couldn’t be more definitive, but I think your original ID is OK! There are no “B-shots” – I only got this one, so I guess a firm ID won’t be possible. Thanks for checking anyway. Were you able to find out what the flower is? Looks like it might be a good one for hummingbirds. Really cool ladybird beetle photo! Still haven’t found out the name of the plant, but funny you should mention hummers. I saw the biggest hummer I’ve ever seen at the flowers the first evening – must have been almost the size of a swallow but with a long tail. It was mostly dark with some blue (I think). How about one of the Neotropical polistines like a Mischocyttarus sp. for the wasp? Beats me – I’m hoping Eric Eaton will stop by and enlighten us! Lots of papers on behaviour in Mischocyttarus that I now feel I should be reading, but I guess I’m a shallow person – I’d rather look at the colourful coreid pictures ! Those Mischocyttarus wasps do indeed look pretty good – if you turn out being right I might just have to give you some honorary bonus points in the current BitB Challenge season! I’m used to polistines being a generally larger lot, but I’ve noticed here in the tropics there are a slew of smallish ones as well. Any interesting tropical diseases yet? Sorry, had to ask! Trying to pick up any parasitic critters?